If you are in need of a delicious yet simple springtime breakfast recipe, you have come to the right place! 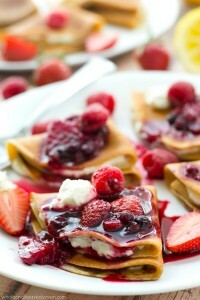 Today, we have a scrumptious recipe for sweet mixed berry homemade crepes. This recipe would make a great breakfast in bed option for Mother’s Day next Sunday. Check out this delicious breakfast recipe below! First, prepare the crepe mixture by combining all the crepe ingredients in your blender. Blend the ingredients together until the mixture is smooth. Then, pour the mixture into a bowl and refrigerate it for at least a half an hour. Prepare the berry sauce while the crepe mixture is chilling. In a medium sized saucepan, combine all the berry sauce ingredients. Turn on the heat to medium-high and bring the mix to a simmer. Then, reduce the heat to low and allow the mixture to simmer. Every now and then stir the sauce until it begins to thicken. Once it has thickened, remove it from the stove and sit it off to the side. Next, make the cream cheese filling by softened cream cheese and sugar in a bowl. Use a hand mixture to combine the ingredients. Add the lemon juice and continue using the hand mixer until the cream cheese mixture is creamy and free from lumps. Finally, turn your stove on to medium-high heat. In a lightly greased pan, pour 1/4 of crepe mix into the pan. You will need to cook the crepes for approximately 1 to 2 minutes per side. Then, flip the crepe and cook the other side for close to 1 minute. After that, remove them from the pan. Continue this process with the remaining crepe mix. Once the crepes have finished cooking, spread some of the cream cheese mix over the top. Fold them over and then top them with berry sauce. Finally, dig in and enjoy!